As I mentioned in my latest blog titled the Week in Review one of the projects I was working on was the 15° box. It’s a variation of the slanted dovetail series of boxes I began building a couple of years ago. Those have been successful on my Etsy Store so this variation developed to keep myself challenged! The prototype is available in the store and both sides slant outward. I wondered if it’s possible to make both of them slant the same direction — so far, so good. The lid will be tricky as it can only be put on from one direction and slid into position; at least that’s the theory, we’ll see when it gets to that stage! Antique, corrugated #7 put to work! Cutting the side pieces to 15° was accomplished at the chop saw, as you know; I use the old Stanley 140 trick when dovetailing. No way to use the tenoning jig so by carefully holding it against the fence the cut was initially made with a rip blade then planed smooth with a rabbet block plane. I do have one of those, can’t afford the pair of skewed ones Lie-Nielsen offers! 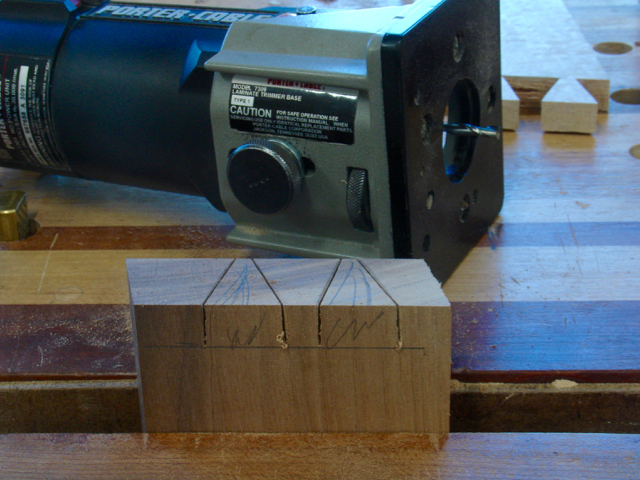 Because of the 15° angle on the sides the angles of the dovetail are different. It took some experimentation before getting what I considered a good appearance. I’m a tails first dovetailer and they are laid out with pencil. If you vary from the line a bit it’s not a big deal since the pin board will be cut to match them. You can see I missed the line a little in this picture. The length of these is 1 1/8″. 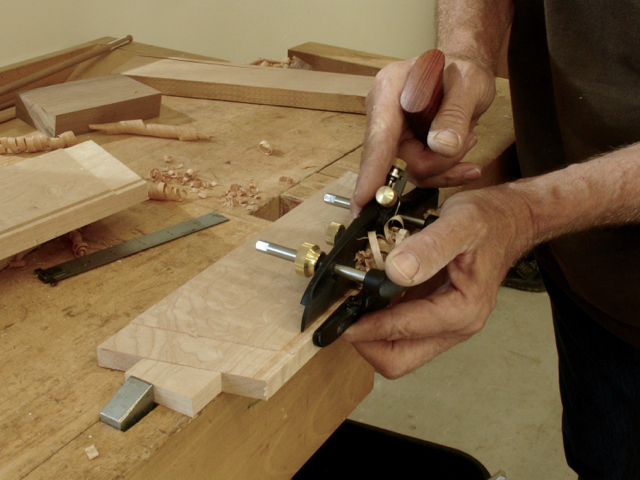 Just like doing drawers, both pieces are clamped together and cut at the same time. Removing the top pieces is done with a crosscut dovetail saw but I always begin the process by cutting a slight notch with a chisel. This helps the saw track on the line. I caught myself just in time and made that cut at 15° so that it was lined up with the shoulder. I have a bad habit of not always cutting to the shoulder line; easier to cut more then it is to “uncut”! The method I use to remove waste between the tails is to first cut a slight notch on the scribed shoulder line. If you remove this little piece of wood you’ll find your chisel will cut down straight. 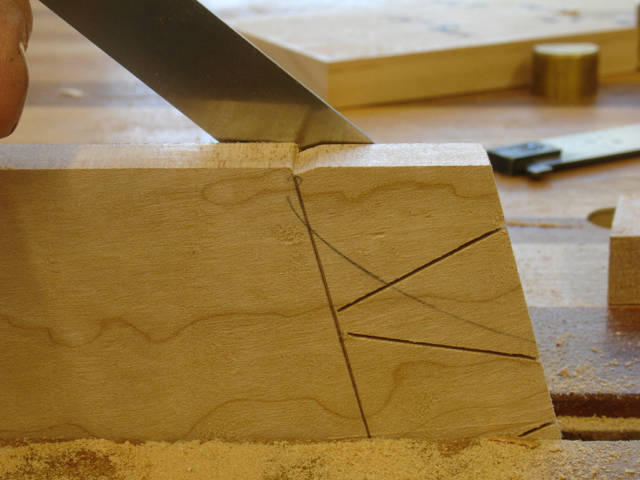 Removing it allows room for the bevel edge which naturally moves backwards due to the bevel. 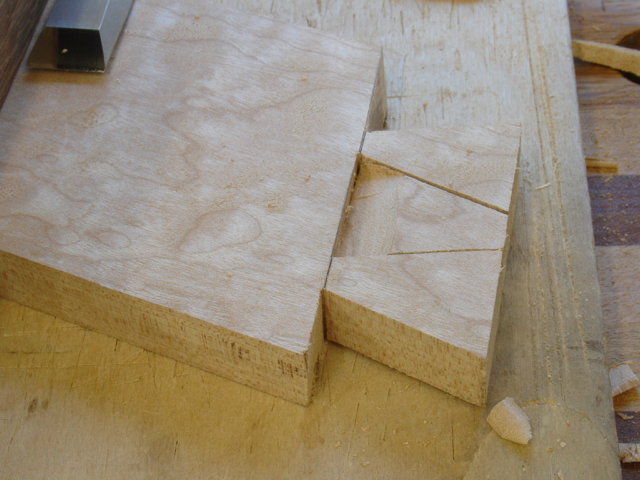 On dovetails this long my technique is to remove material at the base from both sides as you can see. I forgot to mention that before starting the dovetails a groove was cut into the sides with a Veritas Small Plow Plane from Lee Valley. You long time readers of this blog may be saying, wait a minute — didn’t he have a blog outlining the difficulties he had with this plane? Yes, I did and you can check it out here. After my experience with that tool and then being notified that the depth stop slippage has been resolved decided to try it again. 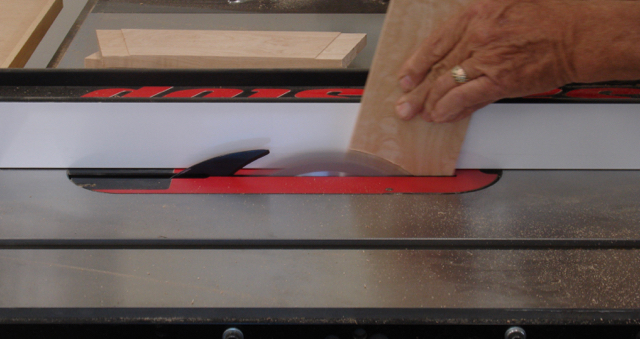 Lie-Nielsen has been rumored to have one in production for several years now but I’m tired of setting up a noisy, dusty router or making a series of cuts on the tablesaw to cut small grooves. Happy to report that the plane works great and the depth stop holds. Doing the pin board for these was particularly tricky due to the angles. After making one big error I found that putting a piece of tape on each end and then on the dovetails being fitted kept me on track. Angles are crazy and it’s super easy to get your ends mixed up. 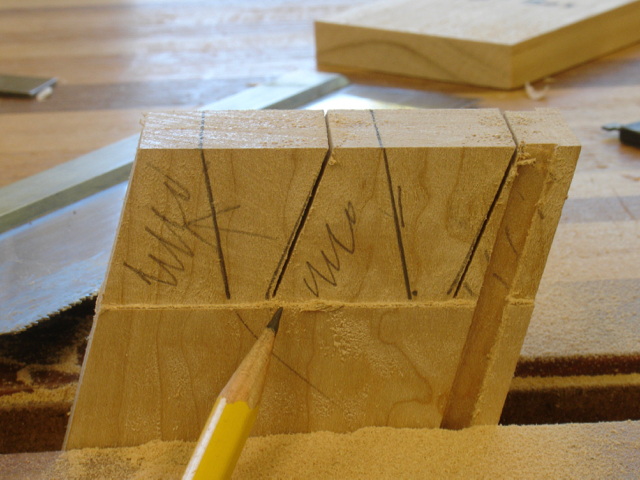 After carefully scribing them on the proper end the first step is cutting with a rip dovetail saw. 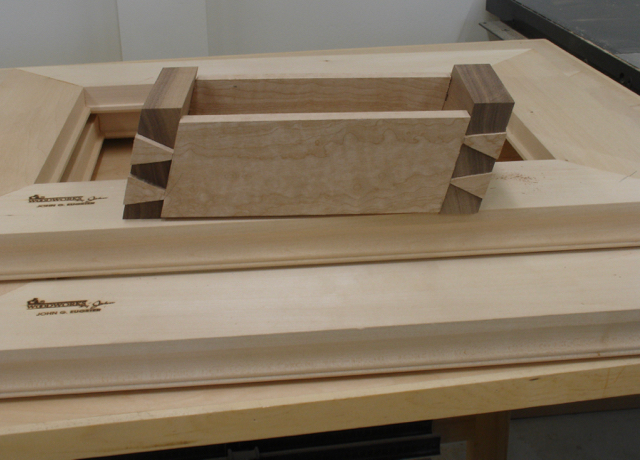 For these long pieces it’s critical that the bottom is uniform so using a trim router with a 3/16″ bit is how I go about that for these long dovetails. Yep, I know; I just lamented about that “noisy, dusty router” but working that much end grain of Walnut or other hardwood that works well for these boxes just isn’t effective. That’s it for a while, this box is well on the way but will be put aside as I have three frames to get ready for Diane. She’s been accepted into the Portrait Artists of Arizona annual show and there are also a couple of paintings she needs to send to her gallery in Charleston. So nice to be able to concentrate more on woodworking a less on the things needed on the house! This entry was posted in Hand Cut Dovetails, Hand Planes, Hand Tool Woodworking, Tutorial and tagged corrugated jointer plane, dovetail layout, Hock Tools, Lee Valley Small Plow Plane, Portrait Artists of Arizona, rabbet block plane, Stanley #7, tails first dovetail, Veritas small plow plane. Bookmark the permalink. I’ve been watching you make this, it’s amazing and a real brain twister!